The Loggerhead Sea Turtle can be found in three places in Georgia that I'm aware of...two are here in Atlanta. The Georgia Coast: the Loggerhead is the most common Sea Turtle found on Georgia's Coast and the only Sea Turtle that regularly nests on Georgia's Coast. Their nesting season in Georgia is typically late-May to early-August. Georgia Aquarium: the Loggerhead (video) is a resident at Georgia Aquarium's Gray's Reef exhibit in the Georgia Explorer gallery. The Loggerhead can live up to 100 years and grow to 350 pounds. The Aquarium also has for kids a Loggerhead crossword puzzle! 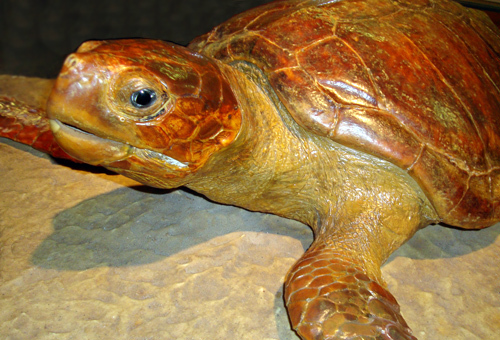 Fernbank Science Center: the Loggerhead (photo) is the "welcoming committee" at the Fernbank Science Center. OK, this one is not nesting or swimming around, but as you enter the Center, the Loggerhead is front-and-center to welcome visitors to a museum where they can learn about the universe, the world, and Georgia. Your site is extremely perfect ... keep up the great job! Fernbank Museum of Natural History: Dinosaurs! ZAP! POW! BAM! : It's Super!